Archer & Evans, Family Drapers, Silk-mercers, &c., Duke Street and Victoria Street, Douglas. This old-established house has been in existence " close upon a century," and was founded originally by Thomas Wilson, afterwards Thomas & John Wilson & Co. Mr. Archer became sole proprietor in 1873, and in 1884 he was joined by Mr. Evans. Since then the house has been conducted with constantly increasing success under the present title, Archer & Evans. The business is the oldest and most extensive concern of its kind in the island, and occupies very fine premises at the corner of Duke Street and Victoria Street, comprising a large and handsome four-storey block, with a frontage of one hundred and eighty nine feet on the two thoroughfares. The corner building is quite an ornament of the locality, and was erected by Mr. Archer, expressly to meet the requirements of their business, at the time when the new street was laid out in 1874. There are eleven large show windows on the ground floor, all of which are most elaborately and tastefully "dressed." Here are exhibited specimens of all the newest and most fashionable goods, British and foreign, in silks, drapery, &c., &c., and the completeness and freshness of the display at all seasons proves how closely Messrs. Archer & Evans keep " in touch " with the great markets of the trade at home and abroad. They receive the latest novelties with remarkable promptitude, and their establishment presents an appearance which would do credit to any London emporium. Internally, the premises amply fulfil the promise held forth by their attractive exterior, and the spacious, handsomely appointed shops exhibit to great advantage a large and magnificent stock, covering every department of the modern draper and silk-mercer's trade. The variety of fashionable goods here laid out for the inspection of customers is not to be surpassed ; and on the first floor there are fine show-rooms with a splendid display of new styles and artistic designs in millinery, mantles and costumes, illustrating all the latest fashions of the day from Paris and London. There are also splendid stocks of carpets and furnishing drapery, gloves, hosiery, furs, ladies' and gents' outfittings, laces, ribbons, trimmings, &c., and the firm have a high reputation in the matter of trousseaux; also a gentlemen's woollen cloth and tailoring department. Every effort is made to secure the newest and best goods of every kind. This house, standing at the head of its trade in the Isle of Man, leaves nothing undone which can tend to maintain and increase its enviable reputation ; and it continues, as of old, to enjoy the favour and patronage of a most valuable and influential connection. A very numerous staff of well-trained assistants is employed, and the firm also have in their service a number of highly, skilled workpeople, whose productions in the millinery, mantle and costume departments are marked by the best of taste and finish. The senior partner, Mr. Archer, has had a career of thirty-three years as a leading merchant in Douglas, and he continues to devote his attention actively to all the affairs of the business. His colleague, Mr. Evans, is also a gentleman of experience and well-known ability, and takes a very prominent part in superintending the execution of all orders entrusted to this thoroughly-representative house by its widespread and numerous clientele in all parts of the island. Waid's Tea Mart, 26, Duke Street, Douglas. W.A. Brearey & Son, Pharmaceutical Chemists, Prospect Hill Douglas. This establishment has been in active operation for over fifty years, having been founded by the present proprietor in 1840. It occupies a position of considerable advantage in the fashionable quarter of Prospect Hill. The premises are very spacious and are contained in a building of three floors, there also being , a large basement. The frontage is twenty-seven feet, and the premises extend to the rear for some distance. The shop is a handsome one, and has a fine plate-glass window encased in handsome brass pillars and framework. It is reached by a lobbied entrance. The arrangement of the goods in the shops is very artistic and attractive, the furnishings and fittings adding to the display All the essentials of a first class chemist and druggist's establishment will be found here, the firm purchasing their supplies from the leading manufacturers and wholesale houses. 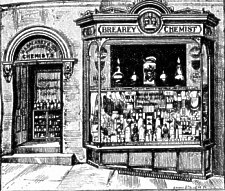 Mr. Brearey is a Pharmaceutical Chemist by examination, London, is a member of the Pharmaceutical Society of Great Britain, and is well read in all the branches of his profession, making dispensing a special feature, and dispenses both British and foreign prescriptions and family recipes, and customers have long ago learned to repose the fullest confidence in him as he spares neither expense nor labour in order to secure excellence of quality and purity in all his preparations. In addition to the thoroughly representative stock of drugs and chemicals, scientific and experimental appliances, there are all kinds of high-class articles for the toilet, perfumes, scent, smelling-bottles, &c., and the firm's speciality in perfumes is a remarkably fine "Lavender Water," which is noted all over Great Britain. The elevating pastime of photography has not been lost sight of by Mr. Brearey, who extensively deals in all kinds of photographic apparatus. This establishment will be found replete with a most useful and attractive assortment of cameras, dry plates, papers, and other sundries required by the amateur or professional. Messrs. Brearey & Son have a dark-room which they place at the disposal of their customers, who receive every attention at their hands. The business is conducted in a most superior manner, reflecting the utmost credit upon the respected proprietor. The above firm have an equally handsomely fitted branch at Prospect Terrace, where the business is conducted in the same approved first-class style as at Prospect Hill. Both businesses being connected by telephone, it really makes them as it were one establishment. At Prospect Terrace there is a Telephone Exchange with communication to railway and steam packet offices, hotels, and principal places of business in the town. Jno. J. Davidson, Watchmaker and Jeweller, Victoria Street, Douglas. This handsome business was established by the present proprietor upwards of twenty years ago. For the extent of stock, and the brilliance of the same, as well as for the artistic care displayed in arranging the goods, and conducting the premises generally, it is generally admitted that this is the leading jewellery establishment in Douglas. It is most advantageously situated at the corner of Victoria Street and Duke Street. The building in which it is located is of fine appearance, and has a frontage of forty-five feet. The shop is approached by two entrances, one in Duke Street, and the other in Victoria Street. The interior has a most superior look about it, and the costly collection of goods lend themselves to furthering the effect. The variety of articles on view are all of a decidedly superior nature, and judiciously bought from the best English and foreign manufacturers. Those in quest of presents, for any occasion, and desiring goods which may really be depended upon, will find it to their advantage to pay Mr. Davidson a visit, where they may always rely upon seeing the very latest novelties. Among the most prominent of the goods in stock are the gold and silver watches for ladies and gentlemen; gold and silver chains and alberts, gold and silver brooches, earrings, necklets, bracelets, sleeve-links, scarf-pins, bangles, ladies' Victoria chatelaine chains, &c. The selection of diamonds and other precious gem rings is very fine. There are clocks of every design and material, striking and non-striking, a beautiful stock of electro-plated goods, and a miscellaneous selection of other pleasing articles. The workrooms are on the premises, and here repairs of every kind of watches, clocks, jewellery, &c., are speedily attended to. The proprietor gives the business his personal attention, and by the spirited enterprise he has displayed has won the respect and support of a large portion of the community surrounding him. Thomas Kewley, Tea Merchant, Wholesale and Family Grocer, Wine and Spirit Merchant, &c., 10, King Street, Victoria Street, Douglas. Established 1796. This thriving and prosperous concern was originally founded as long ago as the year 1796, and was succeeded by Mr. Nicholas Moore, and that gentleman carried on the business with marked success and steady and progressive development for a period of no less than seventy years, until, in 1881, the establishment came into the possession of Messrs. Mylchreest & Co., who were succeeded, in 1884, by the present proprietor, Mr. Thomas Kewley, who still numbers on his books many supporters of the firm of very old standing. The premises occupied consist of a substantial building of four storeys, containing every facility and accommodation for carrying on a very considerable trade, both of a wholesale and retail character. The shop, although not too roomy, is patronised more by the natives and visitors than large and dazzling establishments, and the upper stories are used for storing and blending teas, and for dry goods and general groceries, &c. There is extensive cellarage underneath, where a very large quantity of old Wines and the finest Spirits are stored, while Mr. Kewley has also other large Beer and Porter cellar premises in the immediate vicinity. The stock, which is very considerable and comprehensive, includes high class Teas, general Grocery goods of all kinds, as well as Hams, Bacon, Cheese, Butter, and Provisions of every description. A very good trade is also done in Wines and Spirits, Mr. Kewley being one of the largest holders of Danville's celebrated V.R. old Irish Whisky on the island. Andrew Usher & Co.'s old vatted Glenlivet Whisky is also a speciality, and Bass's Ale and Guinness's Stout, bottled in Mr. Kewley's own admirably arranged cellars. Mr. Kewley employs an adequate staff in each department, and he delivers orders by his own light spring vans to any part of district daily with the greatest punctuality, and also to all parts of the island. He has an influential and valuable connection, and enjoys the full confidence and substantial support of, all who know him. He is a very energetic and capable business man, civil and obliging to all his customers, and is personally universally liked and respected by his numerous customers and brother tradesmen, and in the great English commercial circles. Mr. Kewley, being a young man, has probably very- many years of prosperity before him, and it may fairly be assumed that nothing will be lacking upon his part to maintain his standing as at present one of the leading merchants on the island. A. Cooper & Son, Tobacco Manufacturers, Virginia Mills, 71, Circular Road, Douglas, Isle of Man. This business has not been in existence any great length of time, having been established by the present proprietors in 1884. But there are very few firms that have developed such an enormous trade in a similar period. The premises occupied are known as the Virginia Mills, and comprise a large and commodious general shop, which is heavily stocked with a grand assortment of goods of the firm's own manufacture, and extensive work-rooms in the rear, which are admirably equipped with some of the best and latest machinery and appliances incidental to this important branch of industry. The basement is used for storage purposes. The premises have a frontage of thirty feet, extending backwards to a depth of sixty-three feet, and are most conveniently- situated, being within a few minutes' walk of the North Quay and railway station, and a very short distance from the Belle Vue, where the Manx Exhibition will be held. Messrs. Cooper & Son manufacture black and brown roll tobaccos, cake tobaccos, cut tobaccos in bulk, flaked and packet tobaccos, and a number of excellent brands of cigars and cigarettes in boxes, in packets, and by weight. Special attention is devoted to the manufacture of distinct and well-known brands, which are produced in the finest qualities, and all are exceedingly popular among smokers and visitors throughout the island, they being suited to every taste in smoking. The greatest care is taken to insure the maintenance of a uniform standard of worth and excellence in each class and grade of tobacco produced. This attention has caused the house to have an unsurpassed reputation for the purity of its goods, which are prepared from the best qualities of selected American leaf, upon the most modern principles, and all the manufactures of the firm are guaranteed pure and unadulterated. Messrs. Cooper & Son are also large dealers in cigars, holding stocks in these goods from some of the first-class foreign manufacturers-Manillas, Burmahs, Havana cigars, &c. Samples are forwarded to any distance and quotations given, hotel proprietors, clubs, public-houses, and the trade being supplied on the most liberal terms. All orders by post also receive prompt attention. A number of skilled and experienced hands are employed, under the keen and strict supervision of the proprietors, who conduct the business with admirable energy and ability, each partner taking an active part, and between these two courteous and enterprising gentlemen a policy of administration has been developed which places the prosperity of the house upon a solid and enduring foundation. William Burrows, Picture Dealer, Art Commission Agent, &c., Douglas, Isle of Man. There are few crafts that appeal so powerfully to the tastes of cultured persons as that of the modern art agent and renovator of pictures; and in this connection Douglas is particularly fortunate in the possession of an emporium presided over by a well-known connoisseur of art treasures, and skilful manipulator of old paintings and articles de vertu that are apparently past redemption, in the person of Mr. William Burrows, of Marina Road. Mr. Burrows inaugurated his present prosperous business in the year 1880, and already enjoys a reputation which extends to all parts of the United Kingdom; and to him belonged the honour of having identified and brought to light a famous historical portrait, General Washington, by Gilbert Stuart, which at the time of its resuscitation created no small commotion, and was freely commented upon by the press. Concerning this the Whitehall Review said -"A more than usual interest attaches to the portrait of George Washington, by Gilbert Stuart, the American painter, which has recently been discovered in the Isle of Man by Mr. W. Burrows, the well-known picture-dealer. It possesses an interesting pedigree in the fact that it formerly belonged to Mr. Breed, a well-known Bostonian, who at one time owned Breed Island, Boston Harbour, U.S.A., and whose memory is immortalised in the well-known engagement of Breed's Hill. Mr. Breed settled in the Isle of Man, where his daughter married, and lived in a house known as Mount Vernon, the name, it will be remembered, of Washington's home. Here, since the beginning of this century, Stuart's picture has reposed, undisturbed and forgotten, till the death of the lady referred to brought the work, together with a fine collection of old Dutch paintings, to the hammer." Mr. Burrows operates on an extensive scale as a fine art dealer and art commission agent, devoting the most careful and competent attention to the behests of his patrons, and always with the happiest of results. His opinion and advice upon the merits of works of art are eagerly sought by connoisseurs and collectors, and in this department alone he commands a large and valuable circle of customers. His elegantly-appointed premises are very fully stocked with a splendid collection of rare old prints, proof engravings, oil -and water colour paintings by the old masters, as well as by rising and leading artists of the day; sketches and drawings of "Picturesque Mona," antiques, curiosities, coins, and every description of picture frames. In his executive department he operates as a carver and gilder and manufacturer of all kinds of picture frames to order, and won for this work the only medal and diploma of merit at the International Exhibition, Liverpool, in 1886. As a skilful renovator of old picture frames, window cornices, pier glasses, console tables, to be regilt, &c., he stands unsurpassed in the island, and as a restorer of old oil paintings and other pictures suffering from the ravages of time, he has gained a widespread and well-merited renown. Added to all this, he conducts his business in all its branches in the most capable, judicious and energetic manner, and has deservedly secured the esteem, respect, and liberal support of a large, influential, and still rapidly-growing connection, drawn from every quarter of the kingdom. Testimonials have been received from, amongst others, the Lieutenant-Governor of the Island; the Most Noble the Marquis of Anglesey, Plas Newydd, North Wales; Sir R. Williams Bulkeley, Bart., Baron Hill, Beaumans, North Wales; Lord Rathdonnell, Lisnavagh, Rathvilly, Co. Carlow, Ireland; J. Mylchreest, Esq., M.H.K., White House, Michael, Isle of Man, the Manx Diamond King, &c., &c.
(Residence: 63, Buck's Row). It appears upon investigation that this thriving concern was projected in the year 1861, under the able and vigorous auspices of its present able proprietor, Mr. Thomas Quayle, who, with the capable assistance of his brother, Mr. William Quayle, has bit by bit built up a business of the first magnitude, by sheer practical ability, and the exercise of a perfect knowledge of the details of the trade in all its intricacies. The premises occupied are very extensive, and in every point of character and situation exactly adapted to the requirements of a brisk business of the kind. They consist of a large plot of land facing George's Street, upon which are erected a series of well-appointed general workshops, perfectly equipped for the carrying on of all the operations incidental to the dressing and manipulation of stone, and the sculpturing of monuments and architectural stones of every description out of white and coloured marbles, limestones, sandstones, serpentines, granites, and other rocks suitable for building purposes. A glimpse into the workshops shows that both Mr. Quayle and his brother not only direct the labours of their staff of skilled artisans, but themselves ply the chisel to good effect ; and there may be seen at any time a goodly series of finished specimens, as well as works in progress, which testify far better than any mere words can do to the fact that none but the most unexceptionable work is permitted to emanate from their establishment. A very substantial trade, moreover, is carried on in the erection of walls in plain and ornamental stone, for railways, and the enclosure of public buildings and private dwelling-houses, an excellent specimen of their work in this department being in evidence around the railway-station at Douglas. They, moreover, enter into contracts to keep headstones in good order, and grave-railings clean and neatly painted; and altogether transact a business which has all along been managed with credit to themselves, and distinct advantage to the public at large throughout the length and breadth of the island. Percival F. Johnson, Landscape & Portrait Photographer, Stationer, and Fancy Goods Dealer, 42, Buck's Road Douglas, Isle of Man. In historically reviewing the trades and industries which may be said to have contributed materially to the commercial prosperity of Douglas, and to the needs and requirements of its permanent and fugitive community, it is interesting to meet with a house of such deserved popularity as the one whose rise and progress furnishes the theme of the present brief review. Mr. Percival F. Johnson entered upon his now prosperous career in the year 1880, in Strand Street, where by dint of perseverance and well-directed enterprise he established a first-class reputation, and succeeded in securing such a large share of patronage that he found it necessary, in 1890, to transfer his quarters to the present more commodious and conveniently situated premises, in the Buck's Road, where he now operates on a large scale as a landscape and portrait photographer, and dealer in every description of stationery and fancy goods, His elegantly appointed shop is always neatly and tastefully arranged with a vast and varied assortment of plain, commercial, and fancy stationery; albums and frames; leather goods in the way of bags, purses, and the like ; articles of novelty and utility in glass and china ; bric-a-brac Souvenirs; and a very select series of views and photographs of picturesque Mona. The shop is augmented by a capitally ordered modern studio, where Mr. Johnson devotes the most careful and competent attention to the taking of portraits by all the best-known processes; and has achieved considerable distinction for the clearness, beauty of tone, and finish of his permanent pictures. The business in all its branches is conducted with marked ability and enterprise, upon principles which have won for Mr. Johnson the esteem, confidence, and liberal support of a very large, influential, and still rapidly-growing connection. Organised in the year 1879, this prosperous concern was for many years conducted by its founder, Mr, G. H. Horne, who in 1891 disposed of the business to Mr. Campbell L. Fraser, a gentleman who for many years held responsible positions with leading houses in Edinburgh, London, and Cork. The premises occupied are in every point of character and situation well adapted to the requirements of a brisk high-class business; they are fortunately located in the fashionable quarter of the town, on Prospect Hill, immediately opposite to Dumbell's well-known bank, and consist of a neatly-appointed double-fronted shop, tastefully arranged to hold and display an exhaustive series of Drugs and Chemicals of ascertained purity and standard (British Pharmacopoeia) strength ; Homeopathic Medicines from the celebrated firm of Messrs. Thompson & Capper of Liverpool; popular Patent Medicines and Proprietary Articles, choice Toilet Requisites and Perfumery Appliances, and Sundries suitable for use in the sick-room, nursery, &c., with all the additamenta of a First-class modern Pharmacy. The undermentioned Popular Specialities deserve attention: Fraser's Manx Floral Bouquet, the gem of Mona's perfumes, a most refreshing and permanent essence for the handkerchief or toilet, sold everywhere; Fraser's Pulmonic Powder, for the instant relief of asthma, hay fever, bronchitis, &c. ; and Fraser's Digestive and Liver Pills. Mr. Fraser operates in every branch of his important profession, devoting the most careful and competent attention to the dispensing of Physician's and Surgeon's prescriptions and the compounding of Family Recipes. He is agent for the following preparations: Armbrecht's Coca Wine, Carbolic Smoke Ball, Kepler's Malt and Cod-Liver Oil, Carnick's Beef Peptonoids, Valentine's Meat Juice, Fairchild's Peptonising Powders, Thornton's Disinfecting Tablets, Gage's Hygrometer or Damp Indicator, Fellows' Syrup of the Hypophosphites, Benger's Beef Jelly; Stern's Pumiline Essence, Pumiline Jujubes, and Pepsalia. By his strict attention to duty, well-known business integrity, and courtesy to all his customers, Mr. Fraser has deservedly won the esteem, respect, and liberal support of a large and still rapidly-growing clientele, drawn from all classes of the community. Rt. C. Cain, Linen and Woollen Draper, &c., 44 & 46, Duke Street, Douglas. J. W. Clinch, Lake Brewery, Douglas, Isle of Man. CLINCH'S "ACME" MALT CLEANER AND CORN CLEANER AND GRADER. This notable concern dates beck in its foundation to the year 1779, and was formerly conducted by a Mr. John Hogg, whose common "Jough" had always been held in high esteem in the Island. Mr. Hogg was succeeded in the year 1868 by the present talented proprietor, Mr. J. W. Clinch, a gentleman of " light and leading" in the brewery world, who completely revolutionised the business of the house and enlarged the accommodation, entirely remodelled the plant, secured an abundant supply of water by sinking tube wells on the premises; and by using only the finest Manx-grown barley for making his malt, the best of hops, and the purest yeast, has succeeded in producing a series of unrivalled ales which in the native vernacular have been universally pronounced to be " Glen as raje"' ("clean and strong"). According to a careful analysis of Dr. Augustus Voelcker, Analytical Chemist to the Royal Agricultural Society, the water was declared to be extremely good, and perfectly wholesome. This report was made in 1868, but since then the yield of the spring tapped by the tube wells has more than doubled the supply. This water was tested in 1880 by Mr. Edmund R. Southby, analyst, of Gresham House, Holborn Viaduct, E.C., and its suitability for high-class brewing conclusively confirmed. The machinery and appliances employed by Mr. Clinch embody all the most modern improvements. The water is forced to a large cistern on top of the main building by means of steam pumps. The premises are all supplied from this cistern, and there is also another large one in which water to supply the malting is stored. The barley is cleaned by a special machine and, after passing through the malting process, is stored as malt in granaries. Storage for hops is also provided in these lofts. The malt, after cleaning and weighing, is placed for the requisite time required by the Manx Act of Tynwald, under which the duty is levied, in an " entered room," as it is technically called, in the basement of the. brew-house. It is then lifted to the top of the same building by the steam hoist and crushed into a grist case commanding the mashtub, which is of cast iron. The boiled warts, after cooling, are first fermented and then cleansed in a very complete apparatus, on a modification of the celebrated Burton system; after which they are racked off into carriage casks and stored until required for consumption, in the spacious cellars at the back of the buildings. Steam is supplied to the engines, steam pump, and boiling tanks from a Cornish boiler, placed in a separate building, situated at the corner of Bank Hill, and communicating with the brew-house by a bridge over the private road adjoining. To Mr. Clinch the honour is due of having put into speedy practice the system of air purification promulgated by the illustrious French savant, M. Pasteur. This step is clearly commented upon by The Country Brewers' Gazette :-" Mr. J. W. Clinch, of Douglas, Isle of Man, has, since the year 1879, used a simple and very effective method of supplying the beer, from the time it leaves the hopback to the racking stage, with plenty of pure air. In order to effect this the fermenting-room has been rendered air-tight, the vertical refrigerator cased in, and floating covers fitted to the settling backs. Into the refrigerator casing and fermenting room a fan delivers, through capacious 'trunks,' air which has been first washed in a ' scrubber' and then filtered through cottonwool. The appearance of the cotton after some quantity of air has been blown through it is quite sufficient evidence of what is taken out of the air. But the purity of the yeast, and the stability of the beer produced, are the best testimonials that can be adduced of the soundness of the views upon which such treatment is based, and of the practicability of the method by which it is carried out. We have had opportunity during the last five years of repeatedly testing the wonderful stability of Mr. Clinch's ales Le einte he has adopted the above arrangements. Year after year we have taken a cask of Mr.Clinch's light bitter ale,of about 18pounds gravity, and left it exposed in an open yard from Christmas until the end of June, or even later. We have then set it up in an ordinary cellar. It has dropped bright in a few days, when we have tapped it, and it has remained on draught during a portion of July and all August. We have then frequently bottled the last two or three gallons in the cask, and have kept this bottled beer for a further period of two years. The beer has always stood these tests, and has remained brilliant and in good condition, and free from all excess of acidity, under the most trying circumstances." In connection with practical brewing, Mr. Clinch has also scored a triumph, as the inventor of the valuable contrivance known as Clinch's "Acme" Malt Cleaner, Corn Cleaner and Grader. This machine, in order to separate stones, nails and other foreign matter larger in size than the malt or other grain, consists in the first place of a shaking screen, from which the grain passes into a cylinder of perforated steel, which rotates, and against the exterior of which a brush is lightly pressed. This brush keeps the perforations clear and prevents the choking of the apertures in the steel plate. A spiral brush revolves inside the cylinder, which causes the malt or grain to travel from one end to the other, and in its passage so brushes, tosses and tumbles it about that it arrives quite clean and polished at the delivery end, the rootlets and dust passing through the perforations. On the top of the case a powerful exhaust fan is fixed, which effectually removes all the floating dust, leaving both the malt and the culms or rootlets perfectly clean. The barley before malting is cleaned and graded by a similar machine to that used for malt, but with the perforations in the cylinder larger, so as to remove the undesirable small corns. The sole makers of these machines are Messrs. Stanford & Co., engineers, Colchester, from whom further particulars as to prices, firms who use the machines, and where they maybe seen working, may be obtained. The most recent addition to the premises consists of a building comprising most commodious offices with laboratory (communicating with the brew -house by a bridge) and stores over. In the laboratory the malt and beer are subjected to tests both of an optical and chemical nature, and the stability of the finished article rigorously ascertained by the"forcing" of samples and their microscopical examination. For the rest the high reputation and demand throughout the Isle of Man for Clinch's ales during the decade that has passed is ample evidence of itself that his efforts have not failed to meet with due appreciation and support. William Callister, General Draper, Victoria Bazaar, Victoria Street, Douglas, Isle of Man. -The history of this, one of the most noted, prosperous, and extensive drapery depots in the charming town of Douglas, dates back to the year 1877, when it was successfully inaugurated under the style and title of Messrs. William Callister & Kermonde. Upon a dissolution of partnership in 1882, the entire concern came under the control of its present spirited proprietor, Mr. William Callister, a gentleman of recognised ability and extended experience. Under his regime the emporium has from time to time been enlarged, until it now constitutes one of the largest and most imposing shops in the best part of Victoria Street, and is replete with a stock of the most diversified and attractive description, including everything in household drapery for everyday use, linens, calicoes, flannels, blankets, shootings, quilts, towelling, all manner of furnishing drapery, dress fabrics of the most novel description, millinery, mantles, jackets, dolmans, capes, furs, gloves, corsets, fancy goods, haberdashery, &c. The Victoria Bazaar is manifestly one of those establishments where resources are practically unlimited, and where customers are served with courtesy, efficiency, and despatch at all times. The house develops continuously in all its resources and operations, and a very large and influential trade is effected, the firm's valuable connection taking effect in all parts of the " beautiful isle of the sea." J. E Bruton, " The Abel Lewis " Photographic Art Studio Finch Road, Douglas, Isle of Man. The capabilities of modern technical photography are nowhere perhaps more triumphantly demonstrated than in the magnificent and deservedly popular studio of Ellan Vannin Veg Veen (" dear little Isle of Man "), located in the midst a charmingly laid out garden, from which a glorious view of the Bay Douglas fom headland to headland, may be obtained. The studio in question was projected in the year 1866 by the celebrated photographic artist, Mr Abel Lewis, after whom it is still called, and came, in 1885, under the control of his no less eminent successor, Mr. J. E. Bruton, the winner of the gold medal at the 1886 Liverpool Exhibition and many others, who has since achieved a European reputation. In order to convey an accurate notion of the magnitude, character, scope, and aims of this, by far theleading establishment of its kind in the island, it would perhaps be best of all to give a few facts and figures, gathered during a peep at the emises; and this has been done most excellently by a writer to the East End News, as follows :-" The spacious entrance in Finch Road is in itself an attraction to the ordinary pedestrian, as the show-cases on each side of the porch contain some splendid portraits finished in the latest and most approved style, interspersed with some beautifully-coloured Work. Upon entering the spacious entrance hall an artistically-furnished dressing room is seen to the right, replete with every little requirement for the toilet. Across the hall to the left is a very finely fitted up reception room for ladies, most charmingly decorated by some excellent specimens of photography, which include some magnificent instantaneous views of the Isle of Man. The general reception room is next to the ladies' room, and the number and variety of portraits, paintings, and drawings here exhibited would surprise even those well acquainted with our best of West End photographic studios. As a proof of the class of persons who have patronized this establishment, may be mentioned the names of a few whose portraits I saw, H.R.H. the Duke of Edinburgh, Duke of Sutherland, late Dean Stanley, Lord Lytton, Sir Henry Loch, now Governor of the Cape Colony; Lord Lathom, late Lord Shaftesbury, Archbishop of York, Lord Bishop of Sodor and Man, members of the Manx Legislature, including His Excellency the Governor. There are also many highly-finished portraits on porcelain in this room, and was surpised to learn that the cost of same was about one-half of that charged in London. A rather new idea was an enlargement of a portrait to suit a frame about 3ft. by 2ft., finished in crayon. These cleverly-executed works only require to be seen to secure a ready sale. I also noticed some excellent enlargements from old portraits, and was particularly struck with a most comprehensive view of Douglas Bay taken by the instantaneous process. The studio is approached through a beautiful fernery, which overlooks a spacious garden much frequented by visitors during the summer as the view seaward is magnificent. The studio is 70ft. long, and 20ft wide, the arrangements for light, &c., are perfect, any desired light can in fact, be obtained, so that photos can be taken at any reasonable hour and in any weather. There is a plentiful supply of apparatus and assessories of the most approved description. In close proximity to the studio are two 'dark' rooms, printing room, toning room, mounting room, retouching room, framing room, and the artist's room. In some of these rooms there are racks containing thousands of negatives; and to give some idea of the colossal amount of work turned out, I may mention that one of the racks alone contains upwards of 6,000," and it appears upon enquiry, that a stock of no fewer than 70,000 negatives is held on the premises; being the joint work of Mr. Bruton and his predecessor during the past twenty years. Mr. Bruton has indeed made the benefits of his study, research, and skill practically universal ; and has exerted his best endeavours to make his studio available for all classes of the community and it is therefore small wonder that his clientele is now one of the largest of its kind in the United Kingdom. Benbow & Co., Boot and Shoe Manufacturers, 7, Strand Street, Douglas. This is one of the oldest boot and shoe manufacturing firms in Douglas, the business having been established in 1861. The founder was Mr. J. B. Kelly, who was succeeded by Messrs. Little & Cooper, and successfully carried on by them until the year 1891, when it passed into the hands of the present firm. The premises are of great extent, and consist of a substantially built house and shop, of three-storey elevation, and having a large and convenient basement. The frontage measures thirty-three feet, and extends some distance to the rear. The shop has two handsome plate-glass windows, and the internal fittings are of a very high order. The principal, Mr. Benbow, himself a practical man of many years' excellent experience, in taking over the business is following in the same lines as those which have been so popular for the last thirty years. The policy of the former proprietors was to give the utmost value for money received, and to supply the most superior boots and shoes at thoroughly reasonable prices. This policy Mr. Benbow is implicitly following out. The stock at the present time is an exceptionally heavy one, and consists of boots, shoes, and slippers, for wear on all occasions, by ladies, gentlemen, and children. In the bespoke department the greatest care is taken to ensure a good and easy fit. The best and most experienced hands are employed, and the best seasoned leather, and superior fittings only are used. The connection is a heavy and 'superior one, and customers come from all parts of the town and district. Mr. Benbow is rapidly ingratiating himself with his patrons, his courtesy and attention being much appreciated by them. G. H. Horne, R.D.S.E., Surgeon Dentist, 1, Mount Pleasant, Finch Road, Douglas, Isle of Man. -Mr. Horne commenced his extensive practice as a surgeon-dentist at Douglas in 1880. The premises: occupied are provided with all the modern conveniences for the comfort of patients, there being well-fitted and furnished waiting-rooms, consulting-rooms, operating-room, &c., extensive dental laboratory, &c. The skill of Mr. Horne has become known throughout the whole of Douglas, and in the principal towns and villages on the island, and his connection has . long been a large and superior one. In addition to the home practice, he professionally visits Ramsey, Laxey, Peel, and Castletown, at regularly stated periods, and is at home daily (with the exception of Tuesday), his hours of consultation being from 10 A.M. to 7 P. M. Mr. Horne is a registered dental surgeon of England, and has made teeth his life-long; study, and by careful observation and experience has made many highly important discoveries relative to the cause of decay and its prevention. These discoveries, together with a large amount of interesting facts, new to most readers, he publishes, in a concise and simple manner, in his' "Treatise on Teeth," a copy of which will be at once sent to anyone applying. Long practice has made Mr. Horne an expert in extracting teeth, and such is the care he exercises that delicate ladies and children need have no fear of placing themselves in his hands. Gas of a perfectly harmless nature, which leaves no unpleasant after effects, is administered when desired. This experienced practitioner endeavours to save a tooth when possible, by arresting the decay. He has established a leading reputation for his artificial teeth, which are fitted in such a manner as to do away with clasps or springs. They have a most natural appearance; and assist materially in promoting the health, comfort, and personal appearance of the wearer. Teeth are supplied from 3s. 6d. each, and upper sets from 40s. Complete sets can be made in a day. All branches of dentistry are carefully attended to, such as stopping or scaling, and special attention is paid to irregularities of children's teeth. Mr. Horne is the inventor and proprietor of several valuable preparations, which are meeting with an ever-increasing demand. These are-Coral Dentifrice, for rendering the teeth white; Nervo-Dentine, or Electric Tooth Tino ture, a magic cure for toothache; Tincture of Myrrh and Borax (prepared with Eau-de-Cologne), a most agreeable preparation for the teeth and gums. Mr. Horne pays the strictest attention to each individual case under his notice. Among his clients his kindness and courtesy b highly appreciated, while his strict integrity causes him to be very widely respected. Mrs. Johnson, Importer of Fancy Goods, 68, Strand Street, Douglas. This business, which has been in existence for close upon half a century, continues to receive the cordial support of the residents of and visitors to Douglas. It was founded by the late Mr. John Johnson, who died in 1885, since which year it has been ably carried on by, his widow. The business occupies a large four-storeyed building and basement, with a frontage of twenty-four feet. The spacious shop is se out with a large assortment of goods of a most attractive nature, and the masterly way in which they are displayed greatly adds to their effect. The interior of the shop is also suitably furnished and fitted. The stock on view is of a most extensive character, and represents many of the leading productions of English and foreign fancy goods manufacturers. In. eluded are many exceedingly artistic examples of jewellery, leather goods all kinds of bags, mechanical toys, games and puzzles, ornaments, photographic views, guide-books, medallion and other views, &c. The whole forms a pleasing and miscellaneous selection, affording ample choice for customers in any of the articles named. There are useful and ornamental goods suited for any kind of presentation, or for personal adornment, or household use. The latest and best novelties are being constantly added to the stock as they appear in the market. Visitors and residents alike speak most highly of the courtesy they receive on visiting the establishment, Mrs. Johnson and her assistants sparing no pains to thoroughly satisfy all wants. T. Hogg, Corn, Flour, Provender, and General Feeding Dealer, &C., 9, Lord Street, Douglas. -Mr. Hogg first founded his thriving and flourishing business in the year 1888, and he has rapidly developed a sound and steadily increasing trade of the best class. His principal transactions lie in corn, flour, and provender and feeding stuffs generally, and he occupies very extensive and conveniently situated premises, fronted by a roomy double-fronted shop of old, fashioned appearance, and containing ample warehouse room. The general stock comprises large supplies of whole and crushed corn Indian meal, bean and peas meal, groats, oatmeal, &c., as well as barleys and also oilcakes, cotton and linseed of every description. Mr. Hogg also does a very large trade in artificial manures, &c., of all kinds. He has, in addition, extensive transactions as an insurance and general commission, agent, and represents the Palatine and United Fire Insurance Company Limited, as well as Messrs. Donald Currie & Co.'s "Castle" Line of South African Mail Steamers, &c. He has already, in a comparatively short space of time, gathered round him a widespread and influential connection, whose support is cordial and substantial. He is an active and capable business man, of wide experience and valuable commercist knowledge, and his affairs are conducted with much vigour and spirited enterprise. He is well known and exceedingly popular with all classes in the locality. Walpole Hotel, Douglas, Isle of Man (R. E. Parkinson, proprietor). This well-known hotel was successfully inaugurated in 1890, under the able auspices of its present proprietor, Mr. R. E. Parkinson, a gentleman who had won his laurels in the art of hotel management, as the conductor, for a period of twelve years, of Rothesay House, one of the leading boarding establishments on the Loch Promenade. The Walpole Hotel, as shown in the woodcut, consists of an imposing five-storied structure, apportioned out as follows: -The capacious basement is divided into capitally equipped kitchens, cellars for liquors, and catering and domestic offices of the most modern types. The main entrance gives access to a dining saloon of noble proportions, situated at the rear. Above, accommodation is afforded for luxuriously furnished drawing-rooms and apartments en suite, smoking and billiard-rooms of the first class; lavatories and perfect sanitary arrangements, and a complement of fifty large, light, airy, and comfortable bedrooms. The windows of the hotel command a glorious view of the charming bay; the cooking is faultless, the cellar superb, the attendance perfect, and the charges marvellously moderate. Mr. Parkinson has also displayed in his various rooms some very valuable oil paintings and drawings from the old masters, a collection well worthy the attention of visitors to the island, where is an extensive and valuable library, which is also much appreciated by these staling in the hotel. All these factors combined have made the Walpole one of tha best patronised houses in the town. Mr. Parkinson, moreover, runs the Fort Island Hotel and pleasure grounds in connection with the Walpole, and this sylvan paradise, situated in the entrancingly beautiful neighbourhood of Castletown, affords every facility for the indulgence in delightful alfresco entertainments, picnics, boating, yachtin'r, bath;'in„ fishing, and antiquarian rambles. At the request of many of his customers he is making arrangements for parties camping out on this island, which has every convenience in the shape of pure fresh water, &c., and commands a splendid view of the magnificent bay and country. Everything is done that can be done to make the place popular, and a distinct meed of praise is due to Mr. Parkinson for the capable manner in which he directs his dual undertaking, to the unbounded benefit and complete satisfaction of the residential as well as fugitive community in the island. Jas. Maxwell Coole, Grocer, Wine and Spirit Merchant (the oldest Provision Store in the Island), Victoria Street, and Great George's Street, Douglas, Isle of Man. - It is particularly interesting to meet with a house of such old standing and extensive business relations as the one here referred to. It appears that during the early days of the present century these identical premises were in the possession of a member of the Guinness family, who dwelt here in his Private mansion in the midst of green lanes and charming gardens. With the rapid growth of the town all the available land was built upon, and about half a century ago the substantial country-house was converted into a fine grocery store by the father of its present able and energetic proprietor. In continuing the business Mr. James M. Cooles has had occasion to alter and augment the accommodation from time to time; he has lately introduced one of Andrew's noted gas-engines of the new type which roasts and grinds coffee, crushes corn, cuts hay, works the bottle-washing machine, also a hoist for the warehouse, and works the dynamo for lighting the premises with electric light, the apparatus for which has been erected by Mr. A. Stanbury, electrical engineer, of Liverpool, and is one of the most complete installations in the Island ; and the depot, as it at present stands, with its spacious well appointed double-fronted shop, capacious, carefully constructed cellarage, and ample warehouses annexed, altogether constitutes one of the largest and best-regulated establishments of its kind in the Island. Mr. Coole operates in every branch of his business as a general grocer, provision dealer, and wine and spirit merchant. His stocks are exhaustive, carefully chosen, and well-arranged, nothing of a questionable character ever permitted to enter or emanate from his emporium. A large and manifestly efficient staff of hands is employed indoors, and a large county trade is done in the work of collecting and delivering orders, and the whole establishment bears unmistakable witness to the competent system of management that Mr. Coole has developed and maintained, to the benefit of his house and of its many patrons in the town and its surroundings. J. T. Faragher, Auctioneer, Seed Merchant, &c., Quine's Corner, North Quay, Douglas, Isle of Man. -Mr. J. T. Faragher, of Quine's Corner on the North Quay, has carried on a flourishing business for the past ten years, and has acquired a widespread renown for his exceptional ability. In the sales by auction of all kinds of property and merchandise Mr. Faragher does a very brisk business, and the success that has been gained speaks very highly for his individual ability. In addition to auctioneering, Mr. Faragher does a gigantic business as a seed merchant and dealer in agricultural implements of every description. His premises consist of a large and substantial five-storied stone ware. house, the floors of which intercommunicate by means of hydraulic power, and are always very fully stocked with goods of every description for farmers, gardeners, and others ; the heavier agricultural machines being stored on the ground floor, whilst tools, seeds, and lighter wares generally are kept above. To specify these commodities would be beyond the limits of these pages; but a tolerably accurate notion of them may be gathered from the following list of firms, for whom Mr. Faragher acts as the accredited agent in the island : The Cunard Steamship Company ; Odarns' Manure Company; Day & Son's Horse Medicines; Johnston's Harvester Company's Self Binder ; R. Houston & Sons, Woollen Merchants; Bamford & Son's Combined Mower and Reaper; Woodroffe & Co.'s Albion Iron Works, Chaff Cutters; Powell Brothers and Whittaker's Chaff Cutters, &c. ; G. W. Hurray & Co.'s Hand and Foot Threshing Mills; and the Drogheda Manure Company. For the rest Mr. Faragher maintains a valuable and influential connection in all parts of the island, and enjoys the unreserved confidence of all his clients. He has been an eminently successful business man, winning his laurels in the worthiest and most straightforward manner, and at the present day is one of the best known merchants in Mona's fair isle, and has now the honour of representing No. 1 ward upon the Douglas Town Commission. Brown & Son, Printers and Publishers of The Isle of Man Times, " Times " Buildings, Athol Street, Douglas, Isle of Man. The annals of commercial enterprise in the Isle of Man present many emarkable instances of what individual energy and self-help can do to raise the fortunes of an undertaking from a comparatively humble beginning to one of great magnitude and power for good; and in this connection it is particularly interesting to meet with an example of such eminence as the one here noticed. This prosperous institution was organised in the year 1847 by the late Mr. James Brown, who with his son, Mr. John Archibald Brown, commenced operations in a very modest way, by opening a small printing-office in the obscure quarter of Duke Lane, his plant consisting of a primitive wooden printing-press and a very limited assortment of oldfashioned type. By dint of perseverance and conscientious performance of every "job" entrusted to their care, an advance was made, and a removal was effected in 1850 to a large back room in King Street, where additions were made to the working plant. In 1854 another step higher was achieved, and father and son, still working together without extraneous assistance, acquired the still larger premises, No. 53, North Quay, now occupied by Mr. C. Gallimore. Four years later saw Messrs. Brown & Son fairly installed in Parade Street, adjoining the Royal Hotel, upon the spot now being utilised for Mona's edition of the Eiffel Tower ; and about this time, a company having been formed to float what was called the Isle of Man Advertising Circular, Messrs. Brown were entrusted with the printing and publishing thereof. The Circular languished and nearly died, but Mr. Brown, at the earnest solicitation of his friends, incorporated it with his new venture, of which the following is a plain statement of facts, which subsequently appeared in the pages of his publication, upon the attainment of its " majority" on Saturday May 6th, 1882 :-The Isle of Man Times was established on the fourth of May, 1861, by the late Mr. James Brown, and at first consisted of but a small four-page publication consisting of only twenty-four columns. By dint of perseverance and the careful editing of the journal which soon became famous for its correct reports of local news, six months had barely elapsed before the size of the paper was increased to twenty-eight columns. All this time it was being printed upon a hand-press, but in 1867 a "Belle Sauvage" machine was procured, and the journal extended to forty-eight columns. After several minor enlargements, the full standard of sixty-four columns was reached in 1875, and a splendid Wharfedale machine having been added to the plant, the journal finally assumed its present proportions. On the 8th August, 1888, another marked advance was made; the paper having reached its full dimensions, an increase of size merely would have been not only impracticable but unnecessary, so that a new departure, and a very welcome one, was taken by the publication of a second weekly issue. The premises and plant were simultaneously enlarged, and the proprietor having purchased the old post-office building adjoining, the fine block now known as the '' Times Buildings" was erected, splendidly appointed throughout, and became the home of what is to-day the best-conducted journal on the Island, which is said to be subscribed for by every family in Manxland. Apart from the affairs of the "fourth estate," as well as their job printing, lithographic, and book-binding, Messrs. Brown & Son concentrate their attention upon every branch of the stationer's and bookseller's trade, their show-room in Athol Street being about one of the best-stocked concerns of its kind in the Island. The present personnel of the firm are Mr. John Archibald Brown and his son, Mr. Walter J. Brown, who ably assists his father in the journalistic department of the business. Mr. Brown senior is a gentleman of most extraordinary organising abilities, which have been so fully recognised that there is scarcely a company of any consequence in the Island for which his services on the board of directors have not been eagerly sought. He is a shareholder on most of the great joint-stock concerns in Mauxland, acting either as chairman or as director on many of the boards; and has for many years occupied high rank as a Freemason, being Past Master of the Tynwald Lodge, No. 1,242, having filled the chair as W.M. of the lodge three times, viz., in 1871, 1873 and 1891. He was also the first W.M. of the Ellan Vannin Lodge, No. 2,049, and he has twice over occupied the principal chairs in the Royal Arch Chapter, Athole, No. 1,004. He is also a P.D. Prov. G.DI., and is everywhere respected as much for his well-known integrity and great business qualifications and acumen as for his many estimable personal qualities. His residence, Woodlands, recently built, is, with its extensive gardens, one of the most charming places in the suburbs of Douglas. J. J. Frowde, A.P.S., &c., Registered Dispensing and Family Chemist, The Galen Pharmacy, 4, Windsor Road, Douglas,, Isle of Man. The now well-known " Galen Pharmacy " was organised in the year 1883 by a Mr. W. A. McKown, and was taken over about two years ago by its present talented proprietor, under whose able administration it has grown into one of the most prosperous concerns of its kind in the island. Mr. Frowde is a fully qualified chemist by examination, and holds the diploma of associate of the Pharmaceutical Society of Great Britain. His elegantly appointed premises are conveniently ? ' situated in the very best residential quarter of the town, and almost it, the midst of the leading boarding establishments and visitors' resorts. The spacious shop is most tastefully and methodically arranged to hold and display a complete series of drugs, chemicals, and pharmaceutical preparations of ascertained purity and standard strength, meeting, in fact, all the requirements of the British Pharmaeopceia. In addition to these special prominence is given to a series of medicinal and toilet spccialities,all of which are skilfully and accurately prepared from the purest and best ingredients in the Galen Laboratory, and are enumerated by Mr, Frowde as follows :-FROWDE'S ANODYNE COUGH ELIXIR, an old-fashioned remedy prepared from a recipe which has been in use for nearly a century, and has never been excelled for the immediate relief of coughs and colds (incipient or chronic), hoarseness, difficulty of breathing, and other kindred ailments. The unpleasant tickling sensation which deprives so many of rest at night by the incessant coughing it causes, is quickly removed by a dose of this elixir. Bottles, 1s. and is. 9d.-FROWDE'S ANODYNE LINIMENT, an application for sprains, bruises, &c. ; bottles, 1s.-FROWDE'S TOOTHACHE ELIXIR acts upon the nerve and affords instant relief; 6d. and 1s.-INFANT'S PRESERVATIVE, perfectly safe and eminently effectual; bottles, 1s.-TIC AND NEURALGIA MIXTURE, for the relief and cure of neuralgia, tic dolereux, toothache, and other nerve troubles ; bottles, 1s. and 1s. 9d.REMEDY FOR INDIGESTION, a specific for dyspepsia, heartburn, wind on the stomach, loss of appetite, &c., price Is. 6d., purely herbal. Among other specialities may be mentioned-superior quinine and iron tonic, 1s. 6d. per bottle ; very fine cod-liver oil (special quality), from is. upwards; orange quinine wine (pharmacopoeial strength), 1s. 6d. and 2s. 6d. ; Strong essence of Jamaica ginger, 1s. and 2s. Frowde', superior rose cold cream, an elegant preparation, perfumed with attar of roses, and an indispensable toilet requisite for any period of the year; in winter softening the skin and thus preventing chaps, roughness, &c., usually produced by the severity of the weather; and in summer a most useful application for sunburn, Soothing and sof5ening the skin when hot, dry, and painful from exposure to sun and wind; in jars, 6d. and 1s. May-dew lotion, like the foregoing, a cooling application, more especially intended far Sunburn when accompanied with intense heat. This preparation is of great use for eruptions, chafing, and roughness; sold in bottles at Is. Ispahan dentifrice (rose), for cleansing and beautifying the teeth. It possesses a most charming fragrance, imparts a delightfully refreshing taste and feeling to the mouth, efi'ectually removes tartar and arrests decay; boxes, Is. Old English Lavender Water: In the manufacture of this perfume, unless the very finest ingredients are used, the product will only be of Second-rate quality. The perfume sold at the Galen Pharmacy is prepared fi om the finest oils and essences, and has been pronounced to be equal to any of the most noted brands ; bottles, 1s., 2s. 6d., 5s., and 10s. Frowde's glycerine and cucumber for softening and beautifying the skin, removingtan, freckles, &c.; in bottles at 1s.-Frowde s fluid malt, is. 3d. per bottle. Pomades and hair washes, brilliantine, tricophcrous ; lime cream and assorted cosmetiques; all the fashionable perfumes and essences; perfumery a speciality ; hair, nail, and tooth brushes in great variety; dressing and nursery combs; smelling bottles and vinaigrettes; toilet soaps of all kinds. Homceopathic medicines, turkey and honeycomb sponges, toilet requisites, Surgical appliances, chemical apparatus, fine chemicals. It is positively refreshing in these days of " quack " remedies and nostrums of fabulous virtues to meet with a thoroughly straightforward man of the stamp of Mr. Frowde, who is content to make a plain statement to the effect that his preparations are by no means new, nor, under any high-sounding, fanciful, or obscure name, capable of annihilating all the ills that flesh is heir to by the steady consumption of is. lid, worth at a time, but that they are all compounded according to well-tried, successful brnudo, which have been proved to be highly reliable and effective in the hands of physicians, apothecaries, and chemists in various parts of Great Britain and Ireland, and are guaranteed to be made from ingredients of the very best quality, and it is reassuring to know that he has already won a widespread and well-merited renown for these specialities. ' Mr. Frowde, moreover, operates in every branch of practical pharmacy; and having made dispensing a special study, he makes this all-important I subject a special feature in the business, devoting the most careful and competent personal attention to the dispensing- of physicians' prescriptions, British and foreign, with accuracy, neatness and despatch, strict accordance with their respective Pharmacopoeias and at popular charges. In short, his entire business is a perfect model of what a modern chemist's ought to be, and it is not therefore surprising that he enjoys the esteem and confidence of the local medical practitioners, and the liberal support of not only their patients, but the residential and fugitive inhabitants of Douglas of to-day. "This is an age of many new and growing social wants, greatly enhancing the cost even of legitimate living, and thus necessarily demanding an ever-increasing expenditure, The pressure of these circumstances upon all classes is real, deep felt, and irksome; hence there is much force in the universal cry and demand for a cheaper method of distributing the ordinary necessaries of life. The competitive struggle between co-operative and individual effort for supremacy in meting this want has evolved a system of uniform small profits and cash payments on ordering. This system is perfected and carried out in detail for the advantage of consumers, and they may by their own power of observation see the immense material benefit of from fifteen to thirty per cent. resulting to their advantage in purchasing of the Douglas and the Island Supply Association. Having gained the general confidence of the public, we are resolved that no effort or enterprise shall be wanting on our part to maintain and still further increase and develop this feeling, by tenaciously adhering to the principles which have achieved for us this position. Since we adopted the principle of strict cash payments, we have had several imitators, who have sent out price lists which are only colourable imitations of the one we issue ; we ask consumers to examine prices very closely, and especially qualities of goods supplied, and always to use our list for the current quarter. We issue every quarter, and fix the prices for that period." So "runs the appropriate prelude to about one of the best and most comprehensive catalogues of groceries and " creature comforts " of every class that has hitherto been compiled as a guide to the successful purchase of goods at prices which would be suicidal in any but an establishment doing a "roaring trade." 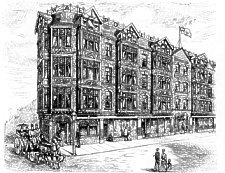 Mr. Charles Dibb projected his great establishment in 1888 and his only premises are located in the best and busiest part of Strand Street, forming, as will he seen from a glance at the accompanying illustration, quite a notable architectural feature of that important commercial thoroughfare ; and a tolerably correct notion of the ample accommodation afforded may be gathered from the following facts and figures:Total depth from front to back, 186 feet ; front sale shop, 96 feet long, 30 feet wide ; bakehouse and factory, 96 feet long, 50 feet wide. Sugar, fruit, and grocery warehouse ; flour, rice, and meal warehouse ; dry goods, paper, and biscuit warehouse ; bacon-washing, drying, and smoking rooms ; stabling, and man's house at rear. Good airy house accommodation fer the thirty-five to forty persons engaged upon the premises. That within the comparatively fleeting period of four years such a flourishing business hive should have been firmly established is nothing short of marvellous, but Mr. Dibb's prosperity has been based upon a foundation that cannot well be shaken, for it is really the outcome of an experience gained only after many years of indefatigable energy in some of the leading houses in the kingdom, and a perfect acquaintance with all the leading markets of the day. The departments represented include groceries, provisions, fresh meats every Friday and Saturday, patent medicines, druggists' sundries, brushes, green fruit, bread and confectionery ; all of which are available at store prices. A branch establishment is now in operation at Market Place, Ramsey. and when Mr. Dibb is absent from headquarters the direction of affairs is assumed with judgment and ability by Mrs. Dibb. Another factor which has unquestionably contributed to the astonishing prosperity of this great depot is, that Mr. Dibb is a firm believer in the efficacy of judicious announcements, and the evidence of his excellently-arranged price lists demonstrates his faith in placing his light upon a candlestick and not beneath a bushel, for his every action proves that he fully appreciates Lord Macaulay's proverb, that, "Advertising is to business what steam is to machinerythe great propelling power." Todhunter & Elliot, General and Furnishing Ironmongers, &c., 20, Duke Street, Douglas, Isle of Man. Dating back in its foundation to the year 1801, the commercial development of this, the oldest-established and largest concern of its kind in Manxland, has been both rapid and continuous from the very commencement. In 1862 the business received a powerful impetus through a change in its proprietory, having, at that time, been transferred from the hands of its founder, Mr. Thomas Gelling, to those of Messrs. W. Todhunter and A. Elliot, both of them gentlemen of recognised ability and extended experience in connection with the important branch of business to which their attention is now (along with Mr. J. G. Elliot, who has now taken his deceased father's position) so vigorously and successfully directed. In its early days the business was conducted in the Market Place, then the leading business thoroughfare in the town. The decadence of that quarter, however, especially after the completion of the Victoria Pier, led the proprietors to transfer their headquarters to the branch establishment which they had opened in Duke Street in 1879, and to retain their original premises for the storage of heavy stock and bulky goods. The Duke Street premises consist of a large and commodious four-storied building, the interior of which opens up to the roof, and is galleried. The ample accommodation thus afforded is most systematically arranged, to hold and display a vast, varied, and valuable stock of domestic, furnishing, building, and general ironmongery of every conceivable kind, including all descriptions of oil lamps, gas fittings, cutlery, and electro-plated ware, kitchen ranges, gas stoves and grates, Milner's safes, bedsteads and baths, tools for all trades, and, in short, everything in the way of hardware. A goodly stock is also held by the firm of gunpowder and explosives, which are stored in two magazines at Walbery Head, they being the accredited agents for Messrs. Curtis & Harvey's Blasting and Mining Gunpowder, and for Nobel's Explosives Company. In the executive department, Messrs. Todhunter & Elliot hold large warehouses and well-equipped workshops at 1, 2, 3, and 4, Cambrian Place, where a large staff of skilled and experienced hands is regularly employed and held in readiness to be despatched at the shortest notice to houses in any part of the island for the purpose of carrying out orders. The firm operate on a very large scale in every branch of engineers' and smiths' work-copper, tin, iron, and zinc plate working, bell-hanging, brassfounding, plumbing, and gas, hot-water, and sanitary engineering. A very large and still rapidlygrowing patronage has been secured, and the admirable organisation of the whole establishment speaks highly for the careful attention bestowed by the talented proprietors upon the administration of this thoroughly representative business. The firm possess a large iron store in Lord Street. J. R. Gray, Hosier, Hatter, Glover, &c. (opposite Grand Theatre), Victoria Street, Douglas. This business was established some years ago by Mr. Gregory, and succeeded to by the present pro. prietor in 1884. The handsome and imposing building is of four-storey elevation, and is also provided with a large and convenient basement. The attractive ground-floor shop has two spacious plate-glass windows, and the premises extend to the rear about fifty feet. The shop is lofty, and is fitted throughout in modern style. The artistic arrangement of the goods in the windows commands the attention of residents and visitors alike. The establishment is noted for always having the latest novelties, and for the superior quality of all articles offered for sale. Mr. Gray makes special lines of waterproof coats and white shirts, holding a great variety in all sizes. The general stock consists of scarves, gloves, braces, dressing-gowns, travelling-bags, umbrellas,_ &c. The latest styles in felt and silk hats may at all times be seen. The stock further embraces clerical shirts and collars, wool and merino hosiery, silk hosiery, wool shirts, &c. Mr. Gray is evidently a believer in small profits and quick returns, for the prices asked for very superior articles are extremely reasonable. Additions are constantly being made to the stock, new goods arriving weekly. There is a substantial trade done, and a good connection exists among regular customers. 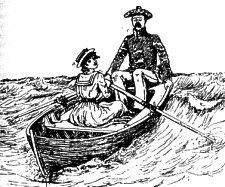 Courteous and obliging, Mr. Gray, aided by his experienced staff of assistants, succeeds in administering to the wants of his customers in a manner which wins their hearty esteem. Aylen & Co.., The Assam Tea Agency, Tea and coffee Merchants, 59, Victoria Street, Douglas, Isle of Man. As breakfast beverages, as well as afternoon and evening drinks, tea and coffee have long held such ascondency in the United Kingdom that their growth, preparations, importation, and distribution may be said to have contributed very materially to the commercial prosperity of the country at large, and the regular employment of a veritable legion of its industrial and commercial population. Tea and coffee have been consequently made the subject of a special study and a definite line of trade; and amongst the most worthy exponents of the business in all its branches a place of prominence must unquestionably be accorded to the house whose rise and progress furnishes the theme of the present brief historical review. The Assam Tea Agency was formed in the year 1871, under the initiative of Mr. T. S. Aylen, a gentleman of recognised ability and extended experience in connection with the important branch of commerce to which tre has so vigorously and so successfully devoted his best energies; and it appears upon investigation that the commercial development of the concern has been both rapid and continuous from the very commencement. In order to indicate the present character, magnitude, scope, and aims of this prosperous firm it would perhaps he best first of all to give a general outline of the premises held, and to supplement this with a few observations upon the nature of the operations there being carried on. 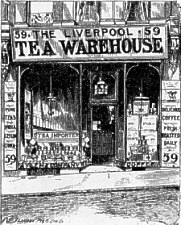 There are three capitally-appointed depôts in Douglas, the headquarters at 59, Victoria Street, a branch store at 61, Duke Street, and a duty-paid warehouse at Fort Street, in addition to new premises at 12, Parliament Street, Ramsey, and offices at 15, Harrington Street, Lord Street, Liverpool. The firm operate on a very extensive scale as direct importers of all the best growths of Assam tea, taking care to secure only leaf of the highest value, strength, and flavour from the planters. This they distribute in original parcels or choicely blended, upon both a wholesale and retail scale, at marvellously low prices ; so low, indeed, that it would be impossible for them to sell except upon the ready-money system which they have all along adopted. They moreover do a very substantial business as coffee roasters and blenders; and in both tea and coffee have won a well-merited renown for the high exea1lence of all their commodities. An important branch has recently been added, the firm now doing business on an extensive scale as wine and spirit merchants. The entire business is most capably and energetically conducted, and Mr. T. S. Aylen now has the proud distinction and satisfaction of knowing that his undertaking takes foremost rank amongst mercantile institutions. Wm. Dalrymple, Cigar Manufacturer, 10, Villier's Buildings, Victoria Street, Douglas. -This extensive business was founded in 1877 by Mr. William Dalrymple, the present proprietor, at 59, Duke Street. This is now used as a branch establishment since the handsome premises were obtained in Villier's Buildings, Victoria Street. These were taken in 1881. The ground floor of the extensive building is occupied, and there is a spacious warehouse at the rear for the storage of the manufactured goods. The premises have a frontage of twenty-four feet, and have been admirably adapted to suit the requirements of the calling pursued. The -window is arranged in a refined and thoroughly attractive manner with a choice selection of the proprietor's own manufactured cigars, as well as with those of English and foreign makers. The interior has an imposing appearance. The shelves round the shop are packed with all the best brands of cigars, and the counters, &c., are also tastefully set out with more cigars, and a large variety of the best and most popular makes of tobacco. This is the depot for the real Limerick twist, which is such a great favourite with smokers, a large stock being kept on hand. The cigar factory is fitted with a modern plant for securing the most satisfactory results, and is worked by a large staff of competent harnda The very best leaf only is used, and this is subjected to Mr.Dalryrmple's well-liked treatment, so that the cigars produced are noted alike for their flavour, and for the manner in which they are rolled. There is a large and wide-reaching connection, and this is of a constantly-increasing nature, Mr. Dalrymple is a gentleman of great. enterprise, and of good business habits. He has made for himself a respected name, and has founded a valuable industry. R. D. Cowin, Bread and Biscuit Baker, 2, 35, and 38 Prospect Hill, Douglas. R. H. Collister, Livery, Bait, and Posting Establishment, St. George's Street, off Athol Street, Douglas, Isle of Man. -The livery stableman and posting master's occupation is still as lively as it was in days of yore in the charming capital of Manxland, and is most admirably represented by the above notable institution. Organised as far back as the year 1846, by its present able and energetic proprietor, the commercial development of this prosperous concern was both rapid and continuous from the very commencement, and to-day the establishrnet! is unquestionably- the most popular and largest of its kind on the island. The premises occupied are centrally situated, and commensurate in size with the magnitude of the business carried on. They cover in all an area of a quarter of an acre of land, and comprise within their limits large covered carriage houses, private order offices, ample accommodation for a large staff of trustworthy drivers and ostlers, and extensive modern stables and looseboxes, for fully forty horses. Mr. Collister owns no less than thirty excellent conveyances of every kind, such as elegant clarence's suitable for wedding and private parties, closed and open phaetons an cars, neat hearses and mourning-carriages, gigs and dogcarts, omnibuses, and wagonettes, and the like; and a large number of good horses and ponies for both saddle and harness. He is connected with the principal hotels and business places in the town. Telephone No. 4. He operates on a very large scale in every branch of his responsible business, and, by prompt attention to orders and strictly moderate charges, has established a business which reflects nothing but the highest credit upon all those who are in any way concerned with the conduct of its affairs. Robert E. Cain, Builder, &c., Circular Road, Douglas. Among the most important and prominently representative commerci and industrial undertakings that flourish in the Isle of Man, a leading place is occupied by the considerable business in general building operations carried on by Mr. Robert E. Cain at the above address. This thriving and prosperous concern was originally founded in the beginning of the present century, by the grandfather of the present proprietor, who came into possession of the business in 1889. The premises occupied ae very extensive and cover a considerable area of ground, the dimensions being forty-eight feet by sixty-six feet. The building, which is of four storey is roomy and substantial, having conveniently arranged offices at the entrance, with general joiners' shop, timber-yard, drying-shops, store room. &c., for all kinds of building and other materials, the whole providing every facility and accommodation for carrying on the business upon a very extensive scale. An efficient staff of skilled and competent workmen, and mechanics is regularly and constantly employed, and the worhshops are throughout fitted with all the necessary- tools, appliances, and plans for every branch of the trade and in a most complete manner. Mr Robert E Cain has a vary excellent reputation for the sound and thoroughly reliable character of his work and the uniform high quality of the materials employed. He is himself a practical and energetic man of business, and is much looked up to and esteemed in business circles In private life he is equally popular and esteemed in a very large cirle of personal acquaintance, and he is specially well known as a good and active Freemason, being a P.M., P, Prov. A.G.P. E. J Bowman, Family and Dispensing Chemist, 53, Victoria Street, Douglas. -This business, which was established in 1843, occupies handsome and commodious premises at the above address, and stands out prominently among the many fine shops located in that leading thoroughfare. The premises occupied consist of a fine lofty building, four storeys high, and having a useful and extensive basement, The frontage is twenty-four feels by fifty-four feet. The spacious shop, on the ground floor, is provided with double-fronted large plate-glass windows, These are always arranged in a most becoming manner, and speak to the high-class nature of the business. Mr. Bowman is a gentleman of experience, his business being the oldest of the kind in Douglas. The dispensing department is the most important in this Establishment, and has a large connection attached to it ; it is carried on under the personal observation of the proprietor, aided by qualified assistants; prescriptions of every kind are accurately prepared, and a register of them kept for future reference. Drugs and chemicals of guaranteed quality only are used, and there is no establishment on the island with a higher reputation for careful dispensing than this. The general stock consists of all kinds of pure drugs, chemicals and chemist's sundries. There are also patent medicines of all kinds, proprietary goods, toilet requisites, perfumes, smelling and perfume bottles, and a host of other useful articles. Here we must not forget to dilate on the excellence of his speciality in the way of perfume, "Manx Heaths:-Bloom Bouquet; " this is most delightfully fragrant and lasting, attractively put up, and the sweetest souvenir a visitor can take from the island ; it has received most encouraging eulogiums from the public and press. He also claims the privilege of being able to supply to the traveller a preventive against mal de mar, viz., " Mites of Comfort," and has testimonials from all over the country, speaking most highly as to their efficacy. As an old resident and tradesman, Mr. Bowman has long borne the hearty respect and esteem of those around him. His genial and outspoken manner is much admired, and he is very popular both in lmsiness and social circles. "I must use Bowman's ' Mites of Comfort.' These Nautical Girls are so Inconsiderate !" Mrs, A. Holmes, Tobacco and Snuff Manufacturer, 5, North Quay, Douglas. -This extensive business was founded in 1866, by Mr. William Warburton. In the year 1868 it was succeeded to by the late Mr. George Holmes, and is now carried on by his widow. In 1878 operations were transferred to the present premises, having previous to this time been carried on in Lord Street. The premises at 5, North Quay are in every way well adapted to the requirements of the calling a pursued. They occupy the extensive first floor. There is an office, store-rooms, and the snaking, rolling, cutting up, and packing departments, in all employing a number of hands. These have for the greater part been employed for a great number of years in this business, and have attained to high proficiency. The factory is well equipped with all the latest modern appliances used in the manufacture of tobacco, including new and improved patent steam machinery. The reputation which has been held for a quarter of a century steadily continues to grow, and the sales, in various parts of the island, have reached large proportions. All tobaccos and snuffs are guaranteed to be of the best and most pure descriptions , and with the aid of the improved machinery and the long experience of the hands, perfection is approached as nearly as possible. This business has long borne a high name for the very honourable manner in which all transactions are conducted, and it is certainly deserving of the patronage it receives. The private residence of Mrs. Holmes is at Sea View Villa, Port Soderick. John Duff, Horse Dealer and Car Proprietor, 42, South Quay, and Royal Hotel Stables, North Quay, Douglas, Isle of Man. Visitors to, as well as dwellers in, Douglas are indeed fortumate in the possession in their midst of the conveniences accruing froth a well-kept modern posting establishment, in the well-known stables and horse and carriage repository situated as above. It was in the year 1871 that Mr. John Duff commenced his business, which very soon assumed a lealing place in the island, in virtue of the capable management and attention bestowed upon the wants of the community, and at present it is acknowledged to be the largest and best conducted concern of its kind in Mona's charming capital. -Mr. Duff recently acquired the car business of Mr. Francis McArdle, at the Royal Hotel stables, North Quay, and in his dual capacity operates on a very large scale in the sale and exchange of horses and carriages, dog-cars, wagonettes, and the like. In addition to this ba keeps a stud of some thirty tractable carriage and saddle horses and vehicles of all kinds for hire, on a scale of charges based upon a clearly equitable tariff. He holds ample accommodation of the most modern and improved class for stabling horses and keeping conveyances, contracts for the removal of goods, and is ably assisted in his work by a staff of reliable drivers, coachmen, stable bands, and others. Thus constituted, it is little wonder that Duff's Repository " rules the roast " in Douglas, and the entire business is conducted in a manner which has won for Mr. Duff the esteem and well-merited support of a large and distinctly high-class patronage, which it is manifestly his resolution shall not only be retained but steadily augmented in days to come. Clague & Craine, Corn, Flour, Provender, Seed and Manure Merchants, North Quay, Douglas, Isle of Man (Telegraphic Address, " Corn, Douglas. Man "). James Holroyd, Family Grocer and Provision Dealer, and Wine and Spirit Merchant, 1, Brisbane Street, Douglas. -A prominent position among the leading commercial undertakings in this district has for many years been held by the thriving grocery- and provision business which is carried on at the above address by Mr. James Holroyd. This busy and prosperous establishment was originally founded in the year 1861, and was formerly- under the proprietorship of Mr. Thomas Hines. The present proprietor acquired the concern in 1885, and he has since devoted much energy and business capacity to the development of an already considerable trade, which lie has greatly increased in scope and extent, and shows promise of further considerable growth and prosperity in the near future. The premises occupied consist of a well-arranged building of three storeys, situated in a flourishing and rapidly extending and improving distriet. The shop is of attractive appearance, fronted with handsome plate glass, and the interior fittings and appointments are excellent. The stock is very large and comprehensive, including all kinds of groceries, and general provisions, hams, bacons, butters, cheese, eggs, canned goods, and similar articles in extensive and attractive variety, all selected with much careful judgment and experienced knowledge of the markets. A considerable trade is in operation, and Mr. Holroyd also supplies considerable quantities of Allsopp's and Bass's ales, and Guinness's stout, and wines and spirits of every description, which he sends out at all times in splendid condition. Mr. Holroyd has an influential and valuable connection among the best residential families and high-class boarding establishments throughout a wide area of the surrounding neighbourhood. He enjoys an exceedingly favourable reputation for the thoroughly reliable quality of the goods he supplies, and is not only well known as a sound and substantial man of business, but he is personally greatly esteemed and respected by all who have the advantage of his acquaintance. Charles T. Cowell, Watchmaker and Jeweller, Prospect Hill, and 21, Victoria Street, Douglas. -These two businesses were established by the present proprietor, Mr. C. T. Cowell, in 1870. Both shops have a prosperous and pleasing appearance about them, and give an impression that the proprietor takes a keen personal interest in them. The two places are connected by telephone. In each case they have a frontage of about twenty-one feet, have handsome plate-glass fronts, and workrooms attached. The display of goods in the windows is remarkably fine, and represents a considerable amount of capital. In clocks especially the show is very brilliant. There are all kinds of French, Swiss, German, and English clocks-striking, in glass shades, and in almost every design and material, and well adapted for all purposes. 'An imposing show is made of English and foreign watches, in gold and silver cases. The prices commence at a low figure, and extend upwards to expensive goods. London, Birmingham, and French jewellery helps to add to the brilliance of the display. The interiors are fitted in a most becoming manner, and the fine showcases contain, in addition to the articles already named, diamond and other precious stone rings, plain gold wedding rings, ladies' and gents' scarf-pins, studs, sleeve-links, gold and silver watch-chains, and a host of useful and ornamental articles of jewellery. These are added to by silver and electro-plated breakfast and tea services, &c. Electro-plating and gilding is done on the premises by a staff of skilled workmen. Repairs to watches and jewellery, also clocks, weather glasses, &c., are well and promptly attended to. Mr. Cowell has the appointment by the Insular Government, the Harbour Commissioners, the railways, and the Steam Packet Company to attend to their clocks, &c. It must not be omitted to mention that very considerable attention is devoted to opera and field glasses, spectacles, " eye-glasses, marine-glasses, folders, &c. The branch business is in charge of an efficient manager, and the two establishments are a credit to their energetic and respected proprietor. R. Williamson, Grocery and Provision Stores, Prospect Hill, Douglas, Isle of Man. A record of the progress of trade in the Isle of Man would indeed lack completeness without reference to the mighty revolution for good that has followed upon the initiative taken by its more enterprising men of business, in their endeavour to stamp out the pernicious credit system from their midst; and amongst the brilliant successes achieved in this direction due recognition must be accorded, in these records of commercial progress, to the prominent part taken therein by Mr. R. Williamson, the well-known caterer, and proprietor of the excellent hotel and pleasure-grounds in the picturesque glen of Laxey. In 1890 Mr. Williamson boldly ventured to establish a first-class grocery and provision store at Prospect Hill, Douglas, for the supply of the best goods exclusively, at store prices, and on store terms, viz., ready money. The result far exceeded his most sanguine expectations, for no sooner did it become generally known that the pick of the markets could here be procured at astonishingly low figures for cash than the success of the venture became established, and the business, progressing literally by leaps and bounds, necessitated considerable extensions, until it assumed its present vast proportions. The spacious shop, elaborately appointed in the most modern style, is situated in the very best and busiest part of the town, near to all the principal hotels and boarding-houses, and the selections from the stocks held are certainly displayed with great taste and judgment, and altogether form one of the largest and most attractive shows of the kind in the island. Mr. Williamson keeps well in advance of the times by purchasing for cash from all the leading markets and producers of the day, and selling for cash upon the principle of small profits and quick returns. lie publishes a complete price list givingfull details of the lines of goods held, which include general groceries of every kind, Italian warehouseman's goods, teas and coffees of the choicest brands and blends ; American, Indian and Colonial, and Continental comestibles and table delicacies of the highest order, and prime provisions of all descriptions in the way of bacons and hams, lard, butter, cheese, and the freshest of eggs; also a good assortment of patent medicines sold at the lowest prices, and a choice stock of confectionery at unusually low prices. The business is under the management of his nephew, Mr. William Cain, who has had many years' experience both in England and on the Island. There is a large staff of civil and manifestly well-trained assistants, and nothing could be more commendable than the order and system which prevail in every part of the premises. For the rest, the business, as already stated, is in a particularly prosperous condition, and its rapid advancement, capable management, and well-sustained good name all combine to justify and preserve the favour in which it is deservedly held. Mr. Williamson has the honour of being one of the members of the House of Keys. S. Shippam, Pastrycook, Confectioner, &c., 25, Strand Street, Douglas. -This business was established in 1867 by Mr, Joseph Smith, and came into the possession of the present proprietor, Mr. S. Shippam, in 1882. This house, which has a reputation which extends throughout Douglas and the districts surrounding it, may lay claim to be the leading confectionery establishment of the place, for the various confections produced could vie with any large London or Liverpool firm, being of the very best description. Matured knowledge is brought to bear on all the various stages of mixing, cooking, &c and the ingredients used cannot be excelled. The premises, which have a refined and pleasing appearance, consist of a building of three-storey elevation, there being also a large basement. The front is a double one, the shop being provided with two compact plate-glass windows. These windows are arranged with great taste, and seldom fail to favouralably impress the visitor or the passer-by. The interior of the shop is a model of cleanliness, good taste, and perfect order. The tempting articles are laid out to advantage, and it is easily seen that a high class business is carried on. At all times there is a choice of fresh confectionery, sweetmeats, pastry of many kinds, meat-pies, &c. This is a famous house for muffins, crumpets, tea and sponge cakes; also for therenowned Manx toffee, an agreeable remedy for sore throats, hoarseness &c. As a manufacturer of wedding cakes, Mr. Shippam has perhaps excelled himself. These wedding cakes are made in artistic shapes,of the most absolutely pure ingredients, and are known throughout the district for their delicious flavour. The bakery, which is situate at the rear, contains every modern improvement suggested by science and experience, and the most superior hands are employed. The basement: is used as stores, and the upper portion of the building is devoted to domestic purposes. The way in which this fine business is conducted does credit to the proprietor, and is worthy of the support so liberally accorded to it. Edward Emett, Fashionable Hatter and Gentlemen's Hosier, London Hat and Cap Emporium, 23 and 25, Duke Street, Douglas,Isle of Man. The distribution of hats, caps, and hosiery to meet the needs and requirements of all classes of the community in Ellan Vannin Veg Veen ("dear little Isle of Man ") is nowhere, perhaps, more admirably and energetically carried on than at the above attractive emporium. Upwards of half a century has elapsed since this prosperous concern was inaugurated, and although its commercial development been both rapid and continuous from the very commencement, it receiced a most powerful impetus some twenty-five years since, when the concern came finally under the sole proprietory of Mr. Edward Emett, a gentleman of recognised ability and extended experience in connection with the important branch of business to which his attention is nov so vigorously and successfully directed. The premises occupied are located in a commanding corner position, its three lofty windows being dressed with great taste and judgment, and displaying all the latest and most fashionable commodities incidental to the trade. Within doors the elegantly appointed shop is very heavily stocked with goods, arranged in the most methodical manner to facilitate the brisk business in operation. Here maybe seen an immense variety of silk and felt hats for both ladies and gentlemen, caps of every conceivable kind, leather hat-cases, carpet bags, mourning hat-bands, men's and boy's braces, gents hosiery. All the goods are derived from the leading makers of the day, and are available at the lowest possible prices consistent with equitable trading. Promptitude and civility characterise the attendants at this establishment, and the entire business is carried on with marked ability, energy, and enterprise, upon a thoroughly sound basis of honourable mercantile principle, in virtue of which Mr. Emott enjoys the esteem, confidence, and liberal support of a very large and still rapidly-growing connection of the best class. T. Witherspoon, Wholesale and Retail Sweet Manufacturer, 11, Strand Street, Douglas. -This business was founded in year 1868, by the present proprietor, and was removed to the more extensive and commodious premises now occupied in 1881. They comprise a spacious and well-appointed shop, with extensive sugar-boiling works and sweet factory, fitted with every convenience for the succesful working of a large and increasing business. Mr. Witherspoon has always on hand a liberal supply of sweets of various kinds manufactured on the premises, and is the original and oldest maker of the celebrated " Isle of Man Rock," and the first maker of the equally popular "Hi, Kelly." Mr. Witherspoon is keenly alive to the fact that the best goods can only be made from the best materials ; the greatest care therefore is exercised in the selection of ingredients of the purest and best quality, and quality is never sacrificed to price. The trade, which is both wholesale and retail is of a, widespread, influential, and steadily growing character. Mr. Witherspoon supplies most of the dealers in the island, and visitors to this delightful health resort never fail to take back with them it a "large parcel', of the "Isle of Man Rock " and " Hi, Kelly," which is eagerly looked, by their friends at home.